Each contributor to this book was given the remit: "If you could go back in time to talk with yourself when you began your studies, what advice would you give?" Hindsight is such a bonus, especially, when vying for your doctorate or postgraduate degree. 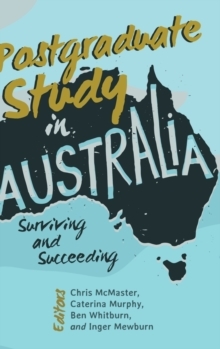 Postgraduate Study in Australia: Surviving and Succeeding addresses this with advice from postgraduate students and recent graduates that will assure that you are not alone in your endeavors. This project follows similar editions that focus on Aotearoa/New Zealand, South Africa, the United States, and the United Kingdom, and is currently being replicated in Scandinavia. This down-to-earth anthology shares personal stories from postgraduate students and recent graduates, employing a practical approach and focusing on the context of postgraduate studies in Australia. This first-person approach to research about postgraduate study helps curate the current understanding, with critical reflections adding to our collective knowledge. Both prospective and current postgraduate students will find this collection insightful.